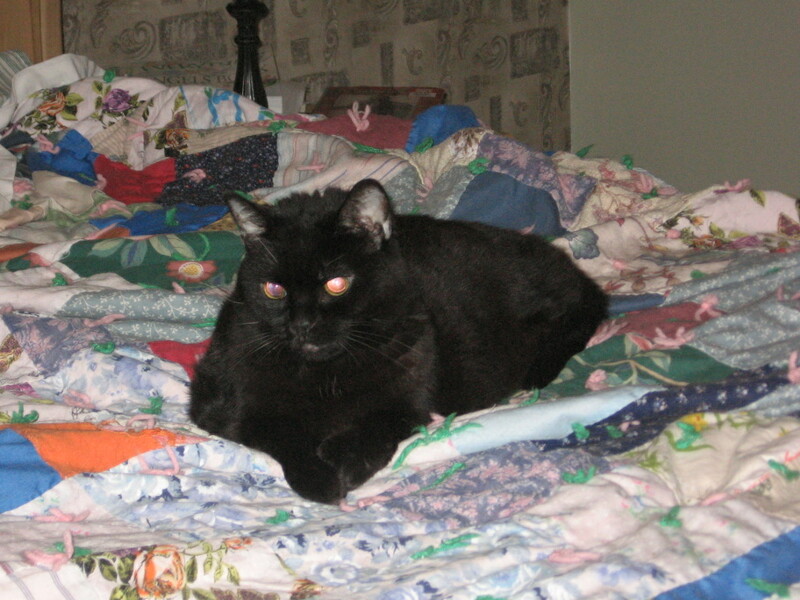 As some of you read previously in this post, my oldest cat was not doing well. I thought it might be nice to post an update. They say that cats have 9 nine lives. Alexandra has had a few more than that, so far. She is a determined old gal. My husband and I both thought this was it. She was ready to move on and leave us. But we were wrong. After spending the weekend at the vets and winning over all of the kennel techs with winning (grumpy cat) purrrsonality (couldn’t refuse), she came home. The vet felt it was her thyroid, so we started her on the meds right away. The first few days, she would not eat at all. I took her back and they gave her more fluids. When I got her back home, she started eating and that made me happy. She is now eating and sleeping like the old Alex. She is gaining weight and her coat looks great. “Don’t write my Eulogy yet, Beeyatch!” Alexandra the Great. What a relief. We hate for our animals to suffer, don’t we? Glad she’s feeling like her old self. So glad she is doing well! I just took Fajita to the vet for staggering. Tests revealed hyperthyroidism, and we will start her on meds tomorrow. Doesn’t explain the staggering, but she is still ruling the roost around here, screeching orders and eating heartily. she is 15, so I think some age-related unsteadiness is ok, as long as she is not bothered by it. Sheesh, it was over $300 for the bloodwork, though. I give my older cats Cosequin. It helps with arthritic pain and some of the unsteadiness. It’s expensive taking care of them. But they are so worth it.